1. The Master of the vessel may make decision to cancel the Voyage due to wave higher than 2,5 meters, as well as high sea, strong wind and poor visibility. 2. The Voyage cancellation decision is made by the Master of the vessel one day prior to estimated date of departure based on weather forecast of Meteorological Observatory. In some cases, the Voyage cancellation decision can be made on due date of departure based on actual weather conditions. Besides, the Voyage may be cancelled due to other conditions, such as machinery failure or any other technical aspects that may affect maritime safety. 3. 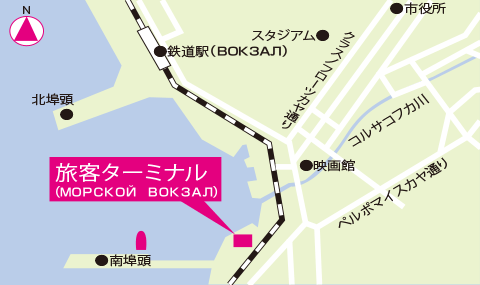 In case of the decision or possibility of making decision to cancel the voyage, such information is to be provided to passengers through the home page or information board on Wakkanai International Ferry Terminal. 4. In case of cancellation of the Voyage, transportation fare is to be refunded. Fare refund should be done in the Agency, where the tickets were bought. Please pay attention, that the refund procedure is not arranged in either port. 5. 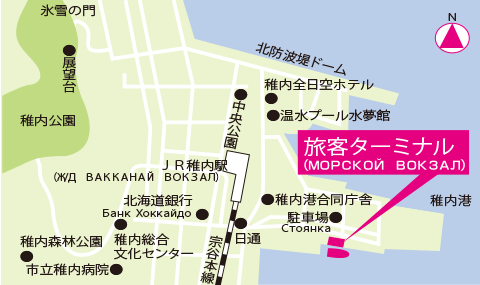 In case of cancellation of the Voyage, carrier Sakhalin Shipping Company (SASCO) and Agencies in Japan do not provide any service in connection with lodging and transport. Please pay attention to this fact in advance! There is no restaurant or any other facility on the board of the vessel. We do not provide any meal (dinners etc). Besides, there are no any stands or vending machines on the board. So, please take care of your meal and grocery items before getting on the board of the vessel. 1.A visa is necessary for a voyage. 2.An application period of a round ticket is one month. 3.In case of cancellation of contract after the departure of the vessel, no refund is applicable. Please be careful! 4.The embarkation ticket can not be passed to a third person. 5.The ticket must be used for the route shown on the ticket only. 6.Reservation, fare confirmation, cancellation, refund or any other questions, please refer to the Agency or transport company. 7.Before check-in any passenger is to purchase a ferry terminal fee ticket using a vending machine in Wakkanai International ferry terminal. Adult: 400 yen, child under 12 years old: 200 yen, under 6 years old: free. 8.This electronic ticket serves as a boarding pass. The seat number is indicated in the ticket. Please keep the ticket during the voyage. © Hokkaido Sakhalin Line Co.